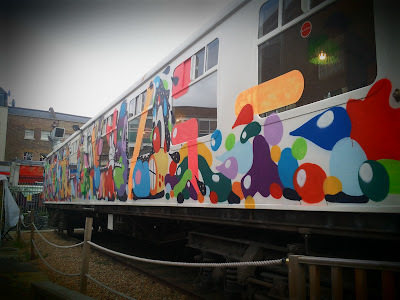 One of the most recognisable elements of the Deptford Project, found halfway along bustling Deptford High Street, is a 35 tonne 1960's South East Trains carriage which now serves as a community cafe. Moved to the site at midnight on Valentine’s Day 2008, the carriage was converted into a café and bistro by Morag Myerscough's Studio Myerscough, based in East London. The cafe is redesigned every now and again in a different style. The carriage cafe serves sustainably-sourced coffee from around the world and home made food from locally sourced ingredients. For more, see http://thedeptfordproject.com/. There's a mass of art around Deptford too, if you know where to look. And of course there's Manzie's pie and mash shop, which has been serving food since the Victorian era... and you can tell from the interior!